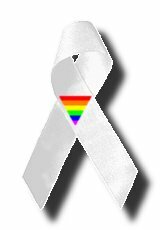 Welcome to the support site for the White Ribbon Gay-Teen Suicide Awareness Campaign. This campaign was started to raise awareness about the epidemic of GLBT teen suicide. It is estimated that a teen in the United States takes his or her own life every 5 hours because he or she is gay, lesbian, bisexual, or transgender, and can not deal with the added stresses that society puts upon them. We as a society MUST figure out what it is we are doing to drive these poor teens to such drastic measures, so we can take steps to stop this tragedy from happening again. Anything we can do to help end this deadly crisis among our youth is a step in the right direction. We may only have less than 5 hours to save a life. I created this site because of the deafening roar of silence about gay teens and suicide According to a 1989 U.S. Department of Health and Human Services study, up to 30 percent of teen suicides are by GLBT youths, and GLBT teens are two to three times more likely to attempt suicide than are other youth. GLBT teens who are trying to come to terms with their own sexuality deal each day with negative messages from family, friends and society, social isolation and lack of a support system during a very difficult time in their life. As a personal survivor of attempted suicide I know all to well that there is a serious vacuum of information out there, and far too many mental health professionals ignore or do not realize that having problems dealing with one's sexuality can be a cause for mental illness and suicide in teenagers. My own personal message to those GLBT teens who are reading this is something I was told while I was hospitalized after my own suicide attempt: In the long run all problems will eventually be resolved. Suicide is a permanent solution to a temporary problem. If you're dead you won't be here to enjoy life when it becomes enjoyable. You are NOT alone in this world. There are hundreds of thousands of other GLBT teens out there. "This site is dedicated to the memory of the many who died too young, and to their loved ones." Why did Robbie Kirkland have to die? The graphic and code for the banners have been updated. If you are already a supporter you should replace the banner on your site with one of the new banners here. Please note the new banners now use a JPEG graphic instead of a GIF for better color resolution, much faster download time, and a smaller graphic file. I lost my mailing list of WRC members in a harddrive crash. I have switched over to using listbot for my mailing list. Please go here and join the new list. Step 1: Save this white ribbon graphic to your directory on your web server. This is usually accomplished by right clicking on the graphic in Navigator or Internet Explorer and choosing "save picture as" or equivalent, then uploading it to your site. Do not access the graphic directly from this server. I was asked recently if I can provide people with real white ribbons to wear on the lapel. The answer is no, but I do encourage you, if you so desire, to go to your local arts & crafts or variety store and get a roll of 1/4 inch (0.5 - 0.75 cm) wide white satin ribbon, a hot glue gun, some hot glue sticks, and some small safety pins and make your own white ribbon like the one in our graphic. Wear it on your lapel or somewhere on your shirt or coat and dont be afraid to tell people what it means if they ask! While you're at it, make some for your friends, your family, or your support group. Help spread the word. It could help save lives. I will add more detailed instructions after I've had a chance to experiment. This site is ©1997-2002 Xaiver Neptus. All Rights Reserved.